This is exciting! 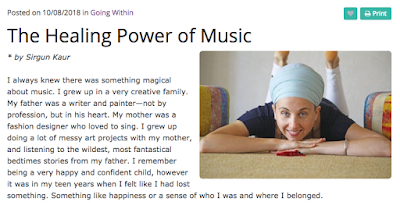 I was asked to contribute an article on the HEALING POWER OF MUSIC for Awaken Center of Human Evolution's Blog! Here I tell the story of how I came to meet the producers of Bhakti Fest, how I was asked to sing response vocals for C.C. White (still so grateful! ), and how I came to be in the right place at the right time--again and again and again. Thank you Awaken: Center for Human Evolution for publishing this blog article!